Some filters are available to all users and some are only visible on snapchat-curated live stories, such as illustrations of Wednesday night's main speakers including Joe Biden, President Obama and vice presidential candidate Tim Kaine. Visit Philadelphia has designated 20 destinations with special paid geofilters throughout the week. 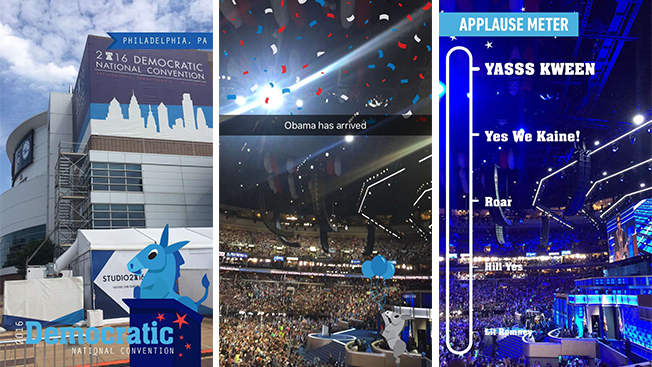 From its own account, the official visitor website for Philly has created five Snapchat stories focused on getting word out about all the DNC-related events around the city that are open to the public. While paid national geofilters launched a year ago, On-Demand paid geofilters (which brands can design themselves) only became available in February, with prices starting at $5 and based on the size of the location and the length of time they're available. There don't seem to be any paid filters from either campaign at the DNC, but brands such as SAP have purchased them elsewhere in the city. 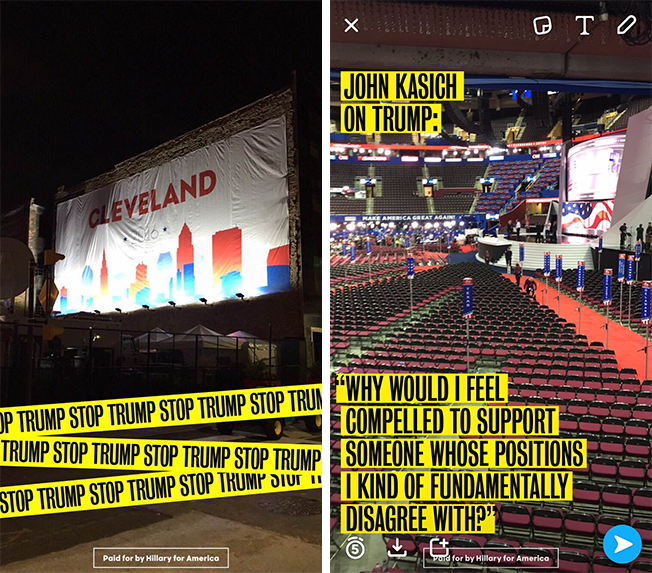 Just last week during the GOP convention in Cleveland, the Clinton campaign bought two geofilters to troll Donald Trump at his own convention.